Our customer walked into our Whitley bay showroom and instantly fell in love with this classic Shaker style kitchen. The simple, square framed doors are classic shaker. It’s a timeless design made highly individual and distinctive by the customers choice of colour and surfaces. This range comes in a stone or painted finish. 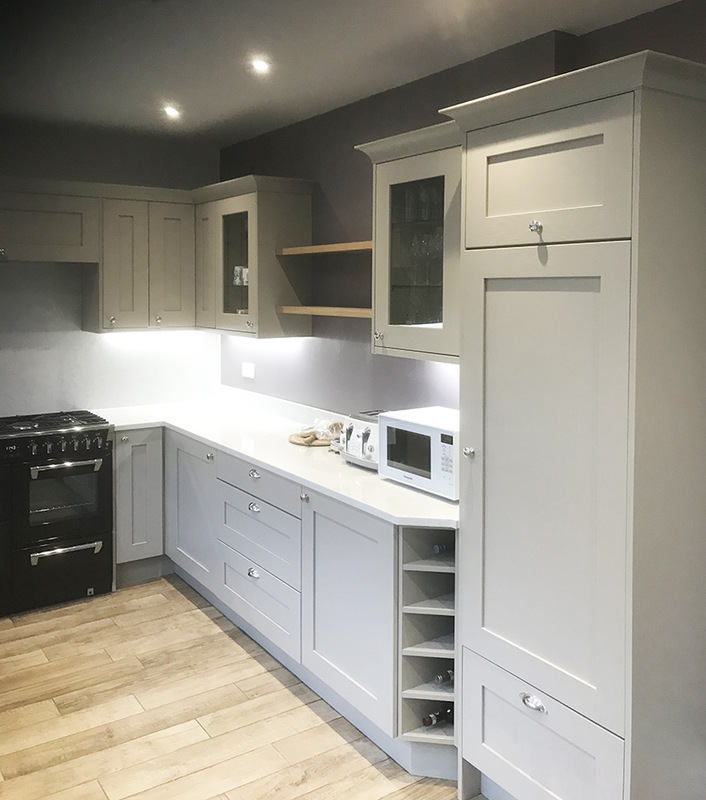 The customer wanted a grey kitchen and this range certainly comes with a choice of greys. From Dove Grey to Trench Coat Grey, there are six shades of grey to choose from. Fortunately, we have lots of samples in our showroom to help make the decision easier. Our lead designer Emrys was also able to produce a hi-resolution 3D visual of the customers kitchen. The result is a quality, modern, fresh new kitchen that feels spacious and clutter free. It’s practical and easy to work in yet feels relaxing with the choice of soft colours and surfaces. Perhaps a little too relaxing looking at the wine rack – there seems to be a few bottles missing!